As we know, for any given arrangement of traffic signals at a junction, there is only so much time to share around; our traffic signal pie if you will (typically 90 to 120 seconds for a complete cycle). In certain places, cyclists and pedestrian numbers outstrip drivers, yet they are only getting a small slice of the pie. What could we do to change that? This is my third in an occasional series of posts about traffic signals, you can read the first and second posts here and here and the caveat remains that I am not a traffic signal engineer. 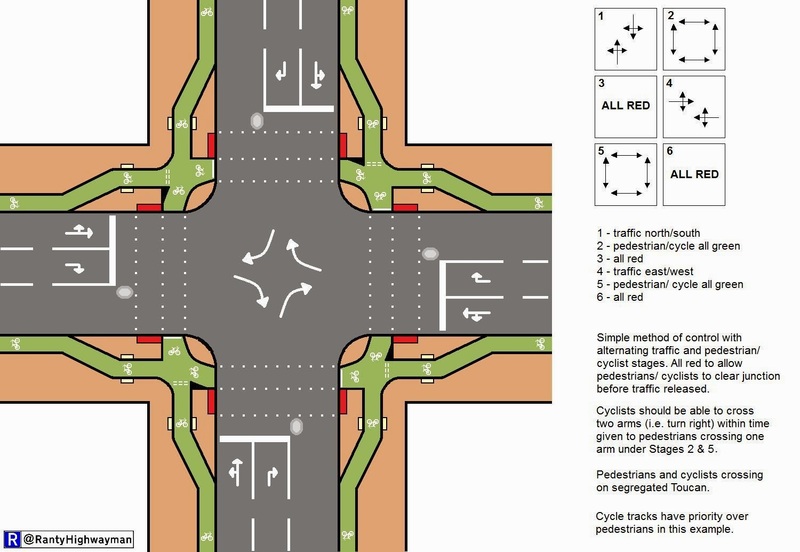 I have recently become obsessed with a US website - Protected Intersection - which has a wonderful video of how a junction could incorporate cyclists within a protected environment. There are signal arrangements that we are just not allowed to use in the UK though. In the video, traffic can turn right (as we would left) on a red signal, but having to give way to pedestrians and cyclists crossing - there is a space for vehicles to stop in this regard. In the UK, a red traffic signal always means stop and not having the same flexibility as the US and many European countries means that junction throughput in the UK is not as flexible. Rather than dwelling on the stuff we cannot do over here (notwithstanding that many would like changes, including me) I have thought how we could adapt the layout to something we could do here and I will float some capacity ideas later. So, last week, I decided to sketch out what a UK version could look like. Take the cycle crossings away and we have a fairly ordinary junction which allows North-South traffic to run together, then East-West traffic and then pedestrians across all far arms at once. A typical UK layout in East-London can be viewed here. It is a little different on site now as there is pedestrian countdown on each arm, but the set up is the same. There is also what is known as an "all red stage" at the end of the cycle which allows pedestrians to clear the junction. If we are being a bit cleverer, pedestrian detection can be used to extend the all red a little longer where there are larger numbers of people or slower people. This is used where the pedestrian signals are nearside (puffin-style). With countdown, this can't be extended because of the fixed time countdown clock. Parallel cycle crossing next to pelican crossing. Westferry, London. For cycling, we can have the same arrangement, but with toucan crossings, although there is some debate if my layout is absolutely UK legal. Possibly, but with a small gap between the pedestrian crossing and cycle crossing, I think it is fine. I have certainly seen plenty of parallel crossings - that is a pelican crossing running right next to a cycle crossing (cyclists have "normal" signals with an amber and green with a bike logo, although a red logo is coming soon). I posted the sketch on Twitter and there was a (small!) debate about the layout. 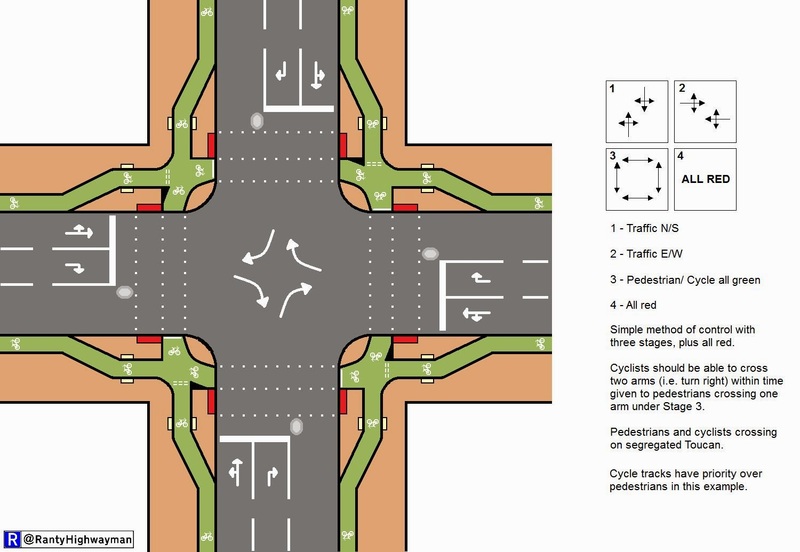 The Cycling Embassy of Great Britain suggested that a rather than one pedestrian/ cycle green per cycle, two would be great to help move pedestrians and cyclists through the junction. So, I tweaked the drawing and there you have it. Because cyclists can move on all arms at once, it is known as a "simultaneous green". Although, there are other ways of doing it. In my sketch, the buff colour is footway and the green is cycle track. The cycle tracks are all one way, perhaps around 2 metres wide at the (rough) scale of the drawing. From a cyclist point of view, left turns are easy (know as "free left turns"), although you will notice a give way just before the left turn point. The idea of this is that any cyclist leaving the carriageway during the green signal time should be given priority to clear the area before traffic is released. For right turns, if the signals are set up right, it would be possible to cross two traffic arms to complete the movement in one go. This roughly assumes that cyclists can get through the junction about twice as quick as pedestrians. Of course, if a cyclists were to turn up at a green signal, they might get across one traffic arm and then have to stop and wait for the next green. If there was only one pedestrian/cycle green per cycle of the signals, then it would be irritating. With two greens per cycle, then this two stage turn wouldn't be too bad. Of course, this is not how the Dutch would do it and with a bit of encouragement from David Hembrow, Mark Treasure and others, I had a play around with my sketch. A blog post about Dutch simultaneous greens from David was also extremely helpful and I recommend you have a read for yourself. Now, my layout is not Dutch, it is a UK-fied (as best I can describe) layout. I have added some red tactile paving to denote controlled (pelican) crossings for pedestrians and buff tactile paving at "uncontrolled" pedestrian crossings of the cycle tracks. With this layout, cyclists have priority over pedestrians. Lewes Road. Footway lowered to cycle track. Giving cyclists priority over pedestrians is an issue because we don't want to design at the expense of pedestrians (in my view anyway). We don't have "mini-zebra" crossings available in the UK. Other countries will paint zebra stripes across the cycle tracks to keep priority with pedestrians. If we were to do this, we would end up with Belisha beacons at every zebra on the cycle tracks. It would look a mess and there is a very real risk of confusion for drivers seeing Belisha beacons and traffic signals used so close together. That is one issue I cannot deal with here, it needs a law change. In Lewes, the footway is dropped to the cycle track. 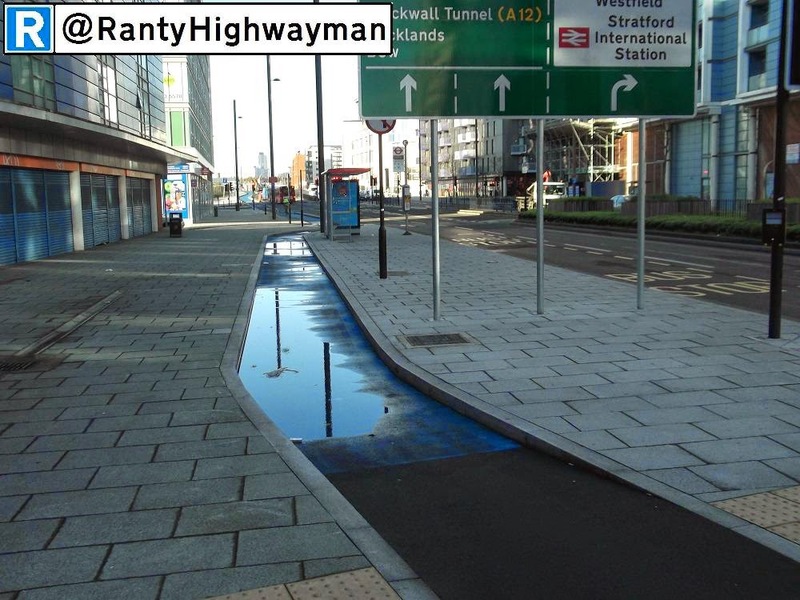 The alternative UK-compliant layout would be as done along the Stratford High Street section of CS2 where the pedestrian crossing points are on little "humps" - that is, the cycle track is raised to meet the footway level (although drainage is more tricky to design). A photo of an actual scale drawing, printed on actual paper! As an academic exercise, I have drawn up a layout based on a real junction using AutoCAD which is pretty much the de facto software for quite a lot of this kind of design work. The drawing has been used in the office to discuss and debate how we could do things. The interesting (and perhaps obvious thing) is even with a colleague who utility-cycles, the concern is that of impacts on motor traffic capacity. The existing layout has two traffic lanes on each arm of the junction (lane 2 right turns in all cases), Advanced Stop Lines for cycles and no green men for pedestrians. In fact, it is the same junction which started this blog post! 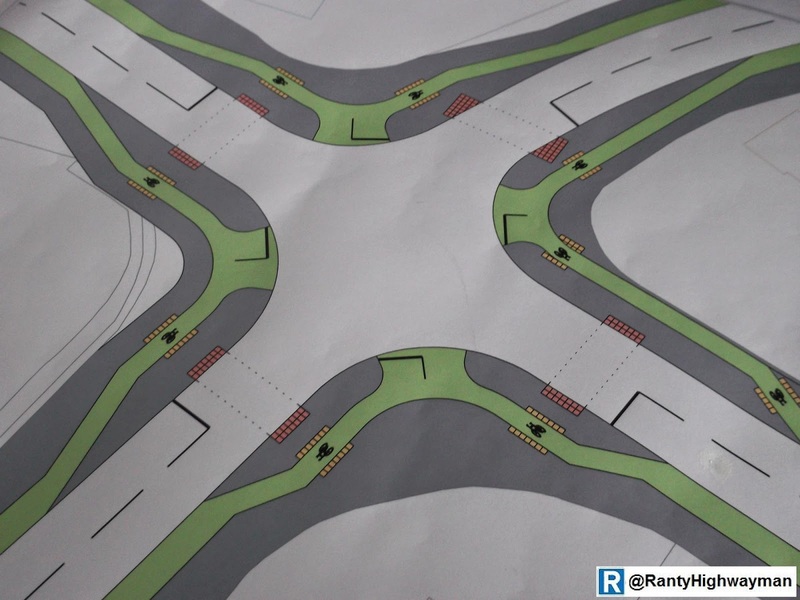 The concept shown here removes a traffic lane from each arm and the space freed up is used to create the cycle track and floating crossing arrangements. If this was done tomorrow, yes, capacity for motorised vehicles would be significantly reduced. My design is "real" world. Traffic lanes are all 3.25m in width (so, 6.5m carriageways), the junction radii are 10m (the right hand corner is 8m), the cycle tracks are 2m in width away from the junction and 1.5m on the corners. The footways are no narrower than 2m and the "floating crossings" are at least 2.5m wide (3m where possible). The controlled (Pelican) crossings are all 2.8m wide and the various uncontrolled crossings vary from 2.8m down to 2m (again space is an issue in places). The distance between the traffic stop line and the crossing studs is 2m. The widths of the cycle track "diagonals" are 3m. Looking at the plan in the photo, the top, bottom and left corners work well. The right hand corner is a compromise. 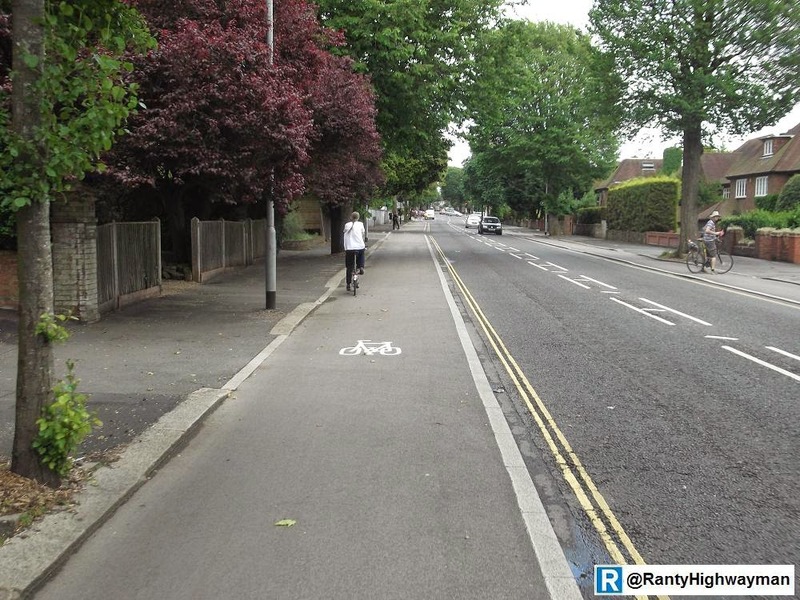 Old Shoreham Road in Brighton - 2.5m Cycle Track shown here. The white area to the right of the right corner is non-highway land (somebody's garden in fact), the road which runs off to the top-right of the plan is on a curve and the angle between it and the road running bottom right is less than 90 degrees. This conspires to make the pedestrian route away from the junction a little more awkward and so the uncontrolled crossing point is well away from the junction on the top side of the road to try and reduce conflict with bikes in a congested area. Bike riders will be tight up against a fence and so at 1.5m, the cycle track will feel tight. Extra land would help so much here. Please remember, this design was an exercise. We would want wider cycle tracks and more pedestrian space so that it doesn't feel squeezed for walking and cycling. In my example, we are on a major road which has no parallel route available for cycling (lots of railway and river bridges). If a decent cycle route were to be built here, it would need protected infrastructure and my design may well be the type of compromise we end up with. We could make the roads one-way, but all four carry bus routes and again, there are no parallel routes. So, bringing us back to Traffic Signal Pie. We have around 90 to 120 seconds to play with for a signalised junction. In my example, the current layout gives just under half a slice to the North-South and East-West directions, with a little "all red" slice to drivers turning right time to clear. To get more motorised traffic through, we need more lanes. But, if we are thinking about getting people through, then an all-round green man and simultaneous green for bikes is certainly far more space efficient than for vehicles. If we are serious about developing decent walking and cycling networks for short to medium urban journeys, then the allocation of space and time at junctions is vital. We must accept that drivers will need to be given a much smaller slice of the pie. Pedestrians and cyclists don't get any pie at in many cases and so motorised traffic remains prioritised by default in many ways. Nice design. Main hiccup I could see (depending on the site and assuming heavy cycle flows) would be the potential 3 way conflict between cyclists coming on from diagonal, those continuing on their desire lines and those trying to get to the stop line. In theory its great but knowing the behaviour of the typical London cyclist I'm not sure the give way lines would be respected when the rider knows he is on a limited green time to get across. The nature of your angles will help to slow cyclists down which would defintely help though and there is potential there. It would take a while for people to get used to it, but it works elsewhere. Compare with Oxford Circus in London which has pedestrians going where they like - seems to work! Have there been any further theoretical applications of this design to other junctions? 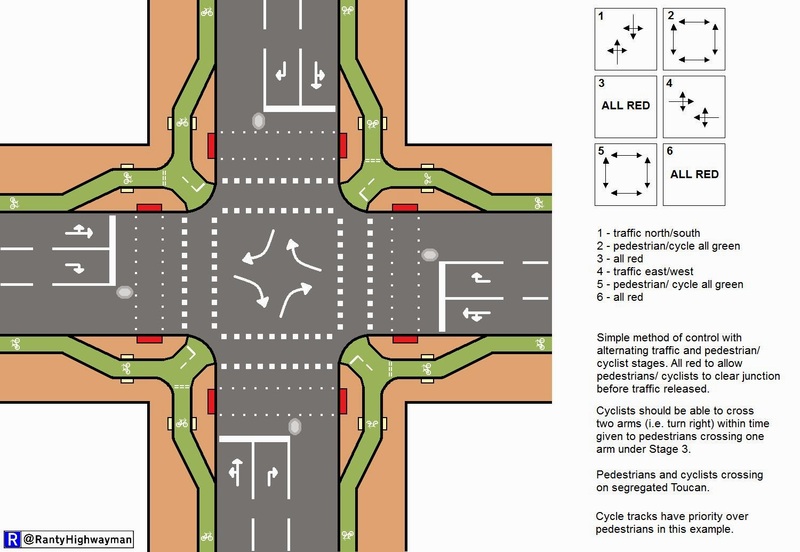 It seems like a great concrete model to use for future discussions, and getting something like the Protected Intersections video for this design could be a great advocacy tool in Britain! Trouble is UK seems reluctant because of conflicts between cyclists - is it really that of an issue when compared with all green pedestrian stage or opposing right turning traffic getting greens toegther? Minor flaw. The standard width of a cycle track should be 2.5 metres for a one way, 2 metres minimum, using angled kerbs, which are no more than 5 cm high (so that hitting the curb is not a problem, no guardrails, any obstacles are in the barrier between cycle track and roadway, which should be at least .35 metres wide, 1.5 metres wide where possible, at least 85 cm next to parking cars, 1 metre suggested minimum and ideal of 1.5 metres. For a two way cycle track, 3 metres is good for a cycle only shortcut, like filtered permeability where it is not part of a main cycle route, 3.5 metres is good for a secondary route standard width with 4 metres being best for a main route (500 metres apart on the grid level), 3.5 metres minimum. Floating bus stop islands should be at least 2 metres wide, 3.5 metres wide where possible, with a guardrail but of a different style (http://streets.mn/wp-content/uploads/2015/05/P1080450.jpg) where the volumes of bus passengers really requires it. In most cases that is not needed. There should be a raise of 30 cm so the gap between bus and island is minimal or within centimetres. Cycle lanes, where they really have to exist, should use the Copenhagen Style curb with wands, also called flex bollards, with a minimum width of 1.75 metres of width of the cycle track, 2 metres preferable, and advisory cycle lanes would be 1.5 metres minimum, 2 metres standard width. Having this sort of design minimums (emphasis on the minimum) and recommendations helps to avoid problems with infrastructure that would be great if it wasn't narrow. Oh, by the way, UK regulations should forbid ALS's except where it is at the exit of of a 20 mph limited area (either signed or zoned), where there is a volume of less than 3000 vehicles per day, where no lorrys are allowed, and only with the permission from the Secretary of State. This helps to ensure that road authorities cannot use ASl's so liberally and everywhere. They also must never be used when there is space for even just a short section of cycle lane and a small barrier, either paint or curb. This also ensures that if there is space to make a cycle track or cycle lane on the exit, it will be used. This was an experiment which is a real-world situation. Wider tracks will be better, but this would require either removal of one traffic lane at each approach or degradation of the footway widths. I doubt the politicians are ready for either at this location, but it isn't being built anyway. I also would do with your particular models to have dedicated left turn lane and mixed thru/right turn lanes. With a 90-120 second optimum cycle time, assuming 3 seconds amber and 1 second red for cars, and 3 seconds amber with 5 second all red for cyclists and pedestrians, we could give cars from one road 20 seconds, so 24 seconds per arm, followed by a 20 second all way green for cyclists and pedestrians, for 28 seconds, add another 24 second cycle for the other road, so 24*3=76 seconds, with a maximum of about 54 seconds, or less than a minute wait. If we set the light to default to red for all traffic, then we don't need to stop anyone and requiring an extra all red and amber phase. I think that the cycle times should work well, and be no worse than they already are. Thanks for this. Is it legal in the UK to have cyclist only traffic signals without dedicated cycle lanes? I am suggesting improvements to a junction in Brighton where the council have a very limited budget to make changes. I will also suggest a full redesign with segregated cycle lanes, but I wondered if it would be legal/possible to *just* incorporate a simultaneous green for cyclists, without doing anything else.